Discussion in 'Apple Watch Accessories' started by ghsNick, Apr 25, 2015. Can we post all the flat Apple Watch stands in here? I don't want mine up in the air being help up with the chance to fall, I'd rather lay it down flat each night. I haven't found any to date so hopefully we can post them in this thread. Currently $59.95 preorder price. 15% discount codes are readily available online. The magnet in the charger of the Apple Watch is pretty strong though. I don't think there's much risk of falling unless there's a cataclysmic pole shift or something. The Studio Proper is pretty sweet! I wish the charging cable came out through one of the ends instead of the back. Not that I could find. I would have gotten it, but it won't work with Milanese or Link bands. use this for the bed stand and the studio for travel. 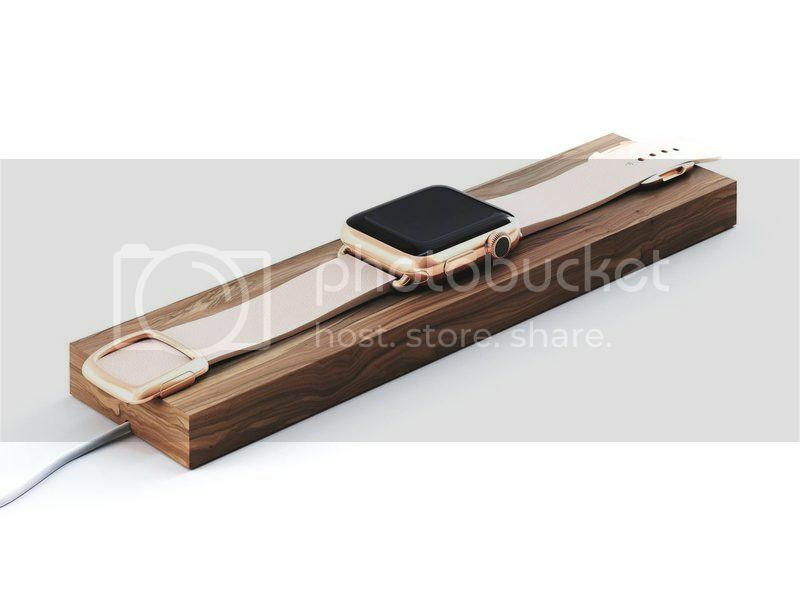 If they were smart they would make this http://www.studioproper.com.au/pages/apple-watch-charging-dock with a rechargeable battery built in so that it would charge the watch all the time instead of just when you had the cable plugged in. All they would have to do is build a rechargeable battery into the box. that would definitely make me buy it right now. Watch low on battery but gotta go to school (or whatever) well through it in the carrying case and you are ready to go once you get to you class! awesome. Sorry for the ruff drawing was in a hurry. the top right profile should say "Apple Recharging Box Side" not "Apple Recharging Box Top"
like i said, if it was like that I would buy in a heart beat. just carefully took apart my sport box and it would be a 5 minute job (a clean job at that) to turn it into that case. Only difference is that it won't be black it will be apple white. Think I may do it this Monday or Tuesday and post pics, need an extra cable first. ya my thought is (I'm sure this is that your thinking) take a powerbank apart and install it inside your sport box. Actually sounds easy if its internals fit, cord management will be the trick probably. Like to see the pictures if you build it. Maybe you could post a step by step on how you did it, what you used, and how much it cost. The watchkeeper one from Studio Proper looks so good! Love the black finish and will certainly keep my watch protected in there when I'm not wearing it. I was going more for having the case as a charging case with a cord, not to include extra batteries. If I do get to work on it, I will take step by steps and post. I am sure there are plenty of forum members on here that have the tools and the know how to make a nice case out of it should they feel like tinkering. testcard and ElizabethorBeth like this.